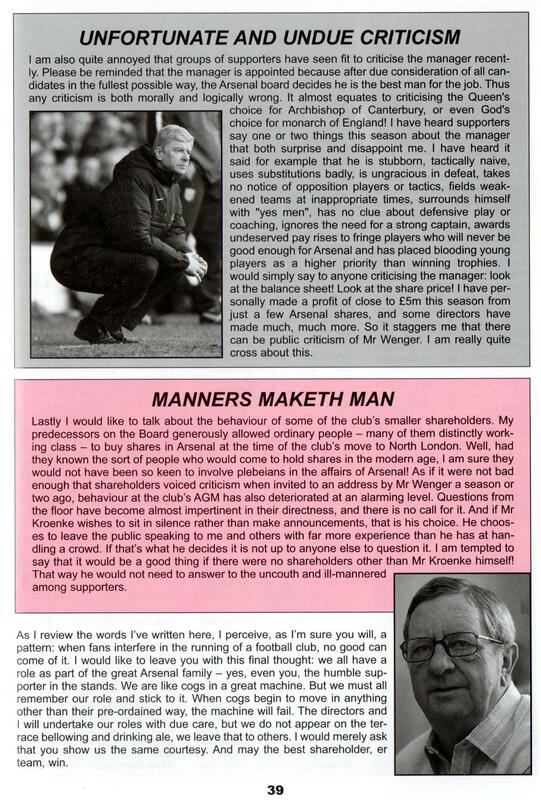 I wrote this for The Gooner issue 215 in 2011. As we’re back in the transfer window and spending money is once again at the top of the agenda, I was reminded of it. I think it’s time Peter Hill-Wood retired. What do you think? I would like to open by saying how pleased I am to be asked to write these programme notes at the end of another highly successful season for Arsenal, a club we all love dearly. Although the destination of some important silverware is still to be decided, I know you will join me in congratulating both the team and manager on a share price of £11,750. Before I go on to the subject of today’s match against our very worthy opponents, who I’m sure will play hard but fair, though I’m confident we will beat them in the end through the skill and hard work of our players, and of course those injections that Mr Chapman gives the fellows before kick-off, which I’m in no doubt are perfectly legal . . . where was I? Oh yes. You may have read that the other directors and I have recently agreed to sell the shares we hold in Arsenal to an American, Mr E Stanley Kroenke. Please do not be alarmed by this. I can assure you that my colleagues and I are all as dedicated to the Arsenal as ever, and in any case, as I’ve said before, this is dead money as everyone knows there is no profit to be made in football since the unfortunate abolition of the players’ maximum wage. I said it when I received £300,000 for selling a large number of my family’s shares to David Dein, and I said it again when he resold them for £75million. Football finances are far too complex for the average fan to understand, so if you are working class you will just have to take my word for it. Anyway, please rest assured that my colleagues and I welcome Mr Kroenke as majority owner of Arsenal and any comments I am alleged to have made at the time of his initial involvement in the club about “his sort” not being welcome were not in any way intended to be taken personally, but were merely meaning foreigners in general, people from the lower classes and those who did not go to a reputable public school. Now, I’ve been asked to say a few words about things that make me annoyed. Well, obviously foreigners (apart from Mr Kroenke), the lower classes, people who didn’t go to Eton or Winchester, and not forgetting allowing women into boardrooms – these things go without saying for any gentleman. But in addition to these I would like to mention another disturbing modern trend, for which I think the game of football has become the poorer. And this phenomenon is: supporters who think they have a right to criticise the team. We have an exceptionally fine group of players here at Arsenal and for fans to voice negative opinion about them is just not cricket. My attention was drawn to a Mr Spy, writing in the most recent issue of this magazine, who claimed that the team would have been strengthened last summer by the purchase for £5m of England goalkeeper Robert Green. This is palpable nonsense. Mr Spy must, in the modern vernacular, need his head examined. Firstly, Green’s ability as goal custodian is not comparable to that of our young immigrant Polish goalkeeper Woch . . . er, Voish . . . um, Vochuk Shesney. Voshwik Chestney. Secondly, Mr Spy has no right to voice opinions in public as he is not paid to run the team. His role as a fan is to support the players we have, rather than undermine them with tittle-tattle undeserving of a gentleman. If he must voice opinions, the least he can do is keep them to the circle of acquaintances at his dining club; it is certainly not a fit subject for the print media. Thirdly, I can only imagine the reaction of Mr Spy and those of his ilk if Green had been purchased and put straight into the Arsenal first team, then made an unfortunate (but inevitable) blunder and presented a goal – possibly even a win! – to our opponents. Mr Spy’s tune, I am sure, would be somewhat different! This is merely one example of supporters voicing unwelcome opinions on players – I am not going to dignify such actions by responding to direct comments on our own players – and I would ask you all to stop it now. We have come to expect a certain level of criticism from the less savoury sections of the press, but this is not the Arsenal way. I am also quite annoyed that groups of supporters have seen fit to criticise the manager recently. Please be reminded that the manager is appointed because after due consideration of all candidates in the fullest possible way, the Arsenal board decides he is the best man for the job. Thus any criticism is both morally and logically wrong. It almost equates to criticising the Queen’s choice for Archbishop of Canterbury, or even God’s choice for monarch of England! I have heard supporters say one or two things this season about the manager that both surprise and disappoint me. I have heard it said for example that he is stubborn, tactically naive, uses substitutions badly, is ungracious in defeat, takes no notice of opposition players or tactics, fields weakened teams at inappropriate times, surrounds himself with “yes men”, has no clue about defensive play or coaching, ignores the need for a strong captain, awards undeserved pay rises to fringe players who will never be good enough for Arsenal and has placed blooding young players as a higher priority than winning trophies. I would simply say to anyone criticising the manager: look at the balance sheet! Look at the share price! I have personally made a profit of close to £5m this season from just a few Arsenal shares, and some directors have made much, much more. So it staggers me that there can be public criticism of Mr Wenger. I am really quite cross about this. Lastly I would like to talk about the behaviour of some of the club’s smaller shareholders. My predecessors on the Board generously allowed ordinary people – many of them distinctly working class – to buy shares in Arsenal at the time of the club’s move to North London. Well, had they known the sort of people who would come to hold shares in the modern age, I am sure they would not have been so keen to involve plebeians in the affairs of Arsenal! As if it were not bad enough that shareholders voiced criticism when invited to an address by Mr Wenger a season or two ago, behaviour at the club’s AGM has also deteriorated at an alarming level. Questions from the floor have become almost impertinent in their directness, and there is no call for it. And if Mr Kroenke wishes to sit in silence rather than make announcements, that is his choice. He chooses to leave the public speaking to me and others with far more experience than he has at handling a crowd. If that’s what he decides it is not up to anyone else to question it. I am tempted to say that it would be a good thing if there were no shareholders other than Mr Kroenke himself! That way he would not need to answer to the uncouth and ill-mannered among supporters. As I review the words I’ve written here, I perceive, as I’m sure you will, a pattern: when fans interfere in the running of a football club, no good can come of it. I would like to leave you with this final thought: we all have a role as part of the great Arsenal family – yes, even you, the humble supporter in the stands. We are like cogs in a great machine. But we must all remember our role and stick to it. When cogs begin to move in anything other than their pre-ordained way, the machine will fail. The directors and I will undertake our roles with due care, but we do not appear on the terrace bellowing and drinking ale, we leave that to others. I would merely ask that you show us the same courtesy. And may the best shareholder, er team, win. January 5, 2012 in Uncategorized. ← Arsenal Player Lifts Trophy! Last couple of paragraphs are outrageous! Fans should have a say into everything a club does since we pay for it! BUT THATS WHY I LIVE IN THE STATES, different mentality here by “ordinary people”! How did that turn out for you guys by the way?! U muppet, ur a disgrace for an arsenal fan! It smells like $$$$$$! Sold ur shares for $300,000 to Dean and he then sold them for $75mil? Maybe u should quit preaching to us? Uhh, you do know this is a spoof, right? Uhhhh, I doooo nowwww! Hands on face! Head shakin! Face turns red! Of course, the fact it’s a spoof doesn’t mean that PH-W doesn’t really think like that, but he just doesn’t say ALL of those things out loud. He has insulted fans though, and I do think it’s time for him to go. Andrew,I am SO GLAD you caught up lol. I know its a gee up,but honestly,i prefer the club being run as it is to a City/Chelsea method. I find it amazing reading Gunners fans comments about Wenger and the board spending habits……or lack thereof…..on one hand,then abusing the crap out of the aforementioned clubs on the other. I think Wenger is a brilliant manager,but I am no yes man that thinks he hasn’t made mistakes. However,he is the manager of the club I support,the club I love,so you will never,ever here me asking for his head. Let me qualify that……..Wenger absolutely loves the club,and while he is doing his best,I am comfortable with him. Question……..Sunderlands board hired Steve Bruce……..Steve Bruce didn’t do an adequate job…….Steve Bruce is sacked by the board. The question is coming……bear with me. The board hires Martin O’Neill…..wins are coming,everythings rosey. My question is why should the board not quit or be sacked??? Look at the dickhead fans of Blackburn calling for Keans head……….don’t tell me he isn’t trying his best!!!! In each case the BOARD made the decision that had their team relegation bound,surely the blame should be aimed squarely at them. Fans should never blame a manager if he is putting in 100% effort……blame the people that employed him. Boards do have a lot to answer for, but they employ managers to do a specific job that they can’t do themselves. If the manager fails that’s not always the Board’s fault. I agree about the general way Arsenal is run compared to City and Chelsea, but the problem at the moment is that the money we know is there is not even being spent. Why not?